Steiger liked to name their machines after large cats, and the ST310 was no exception. Produced from 1974 to 1976, the Steiger Panther-II ST310 had a large, Diesel-run 14.0L six-cylinder Cummins engine that put out 310hp. The ST310 had four-wheel drive, a ten-gear transmission, and a climate-friendly cab. In 1976, Steiger released an upgraded version called the Panther-III ST325. The engine was produced by Caterpillar and was a larger 14.6L Diesel engine with six cylinders. This engine put out 325hp, hence the name. The ST325 transmission had twenty forward gears, and four-wheel drive. It was in production from 1976 until 1983. Produced for only two years, 1976 and 1977, the Panther-III ST320 had a Cummins eight-cylinder engine that produced 320 horsepower. It was run on Diesel and had a turbo. The transmission had twenty forward gears and four reverse gears. The Steiger Panther-III ST350 was produced from 1977 to 1981. Like the eight-cylinder engine of the ST320, this Cummins engine was run on Diesel and had a turbo. This one, however, put out 350hp. Also, like the ST320, the transmission had twenty forward gears and four reverse gears. Both tractors had a safari cab, as well. They were essentially the same tractor, but the ST350 had more ponies. The last of the Panther ST series was the Panther-III ST310. It had the same six-cylinder engine as the Phase-II ST310, but the transmission had a turbo added. This gave it twenty forward gears and four reverse gears. 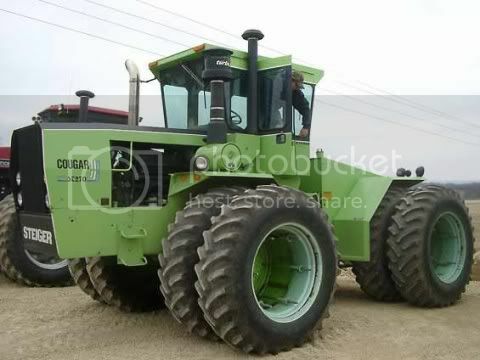 Like all of the previous Steiger Panther STs, the Panther-III ST310 weighed around 31,000 pounds, and was painted the “Steiger” lime green. I’m looking for a wiring diagram for a Panther-III ST320 with 903 cummins. Also wondering about the electric breaker on the dash, “Down for Run”. What does it disconnect when it breaks, can it be checked that it is functioning properly and is there a replacement available?